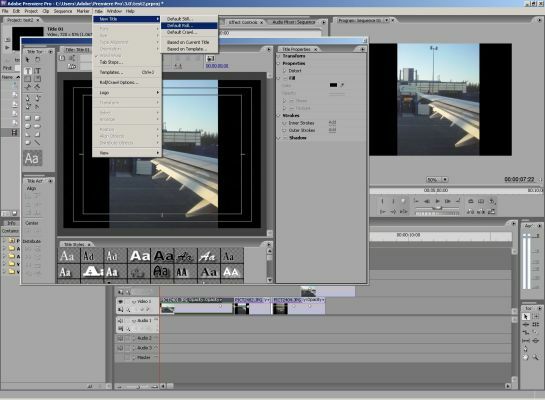 Microsoft Movie Maker: Especially in the version for Windows Vista, it should suffice to create quick concept videos with enough possibilities to create effects, transitions and audio. Simple but quick to learn and use. Pre-installed on most Windows Computers. Adobe Flash: Development environment for the ubiquitous animation sequences. It takes some time to learn the concept but is then extremely versatile. The Actionscript language - Java like - offers possibilities that go much further than simple animation creation. Very useful to know. 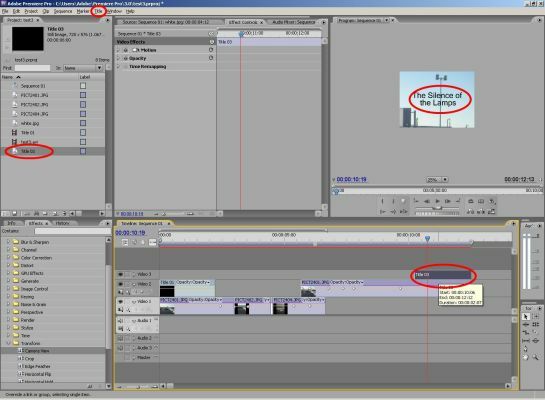 There is a 30 day trial version of Flash CS3 Professional on the Macromedia website. 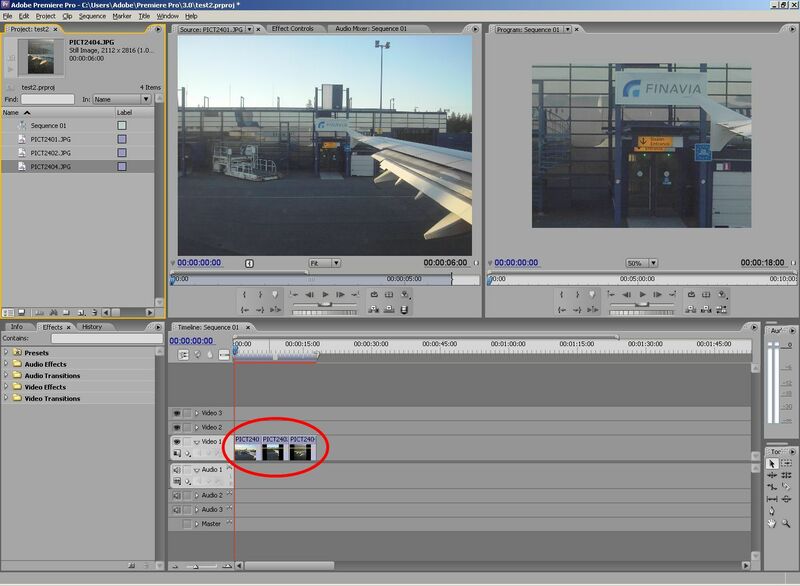 Adobe Premiere: The tool of choice for creating even quite complex sequences and movies. Even though complex, after getting the idea of a few things one can create simple presentation quite simple. There is a 30 day trial version of Adobe Premiere Pro CS3 on the Adobe website. Other tools: There is a huge amount of small programs that can be used to create simple videos. Even MS Powerpoint offers some basic features. Try a web search and if you find a program that you find useful, please tell me. In the following, the few steps necessary to create a small video on an arbitary subject are shown as an example of how to use the application. The project file for Premiere and the sample images are available here: simpleClip.zip. Open a new project (e.g. DV - PAL, Standard 48kHz) and load a few pictures / video clips into it. Open a new project and load a few pictures / video clips into it. Drag the clips in the order you want them on the timeline. You can adjust the order and duration they will be displayed anytime by dragging them and their borders. In the "Effects" tab, there are many effects and transitions that can be used. Select a clip and drag, e.g., the "Crop" effect to the "Effect Controls" tab. The effects can be used to alter the clips / images. Here, the crop and motion effect was used on a landscape picture to crop ("left 45%") and center ("position 204.0") it to align it with the other portrait mode pictures. 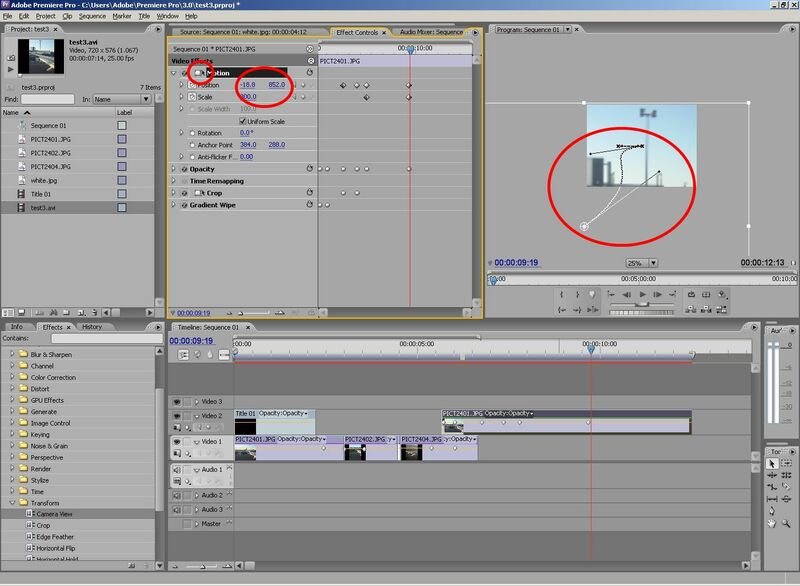 The most important concept for video effects and transitions are the keyframes. These are frames where an effect can start or end. Select a clip in the timeline, position the time slider at the frame / time where you want to set a keyframe and click on the small diamond below "Video 1". 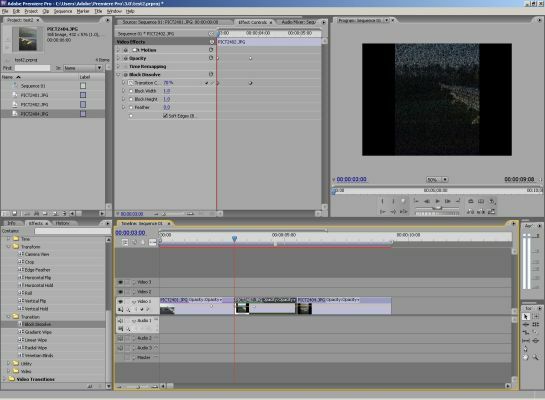 The keyframe diamond also appears on the "Effects" timeline. To enable the use of an effect using keyframes, first click on the "Toggle animation" symbol to the left of the effect name. A keyframe symbol appears in the effects timeline for this effect. You can assure that the time indicator is positioned exactly on the position of a keyframe by clicking on the left/right arrows beside the diamond icon. We set the "Block Dissolve" "Transition Completion" value to 0% at the first keyframe. To set keyframes for a specific effect, click on its "Add/Remove Keyframe" diamond icon. it will be shown in the timeline. We set the "Block Dissolve" "Transition Completion" value to 100% at the second keyframe at the end of the clip. 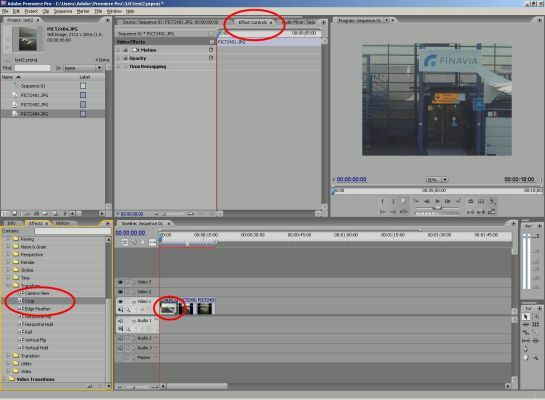 This means that from the first to the second keyframe, the picture will be completely dissolved. A transition can be done by using the same technique on the following clip setting the dissolve effect to 100% at the beginning and to 0% at a later point. Effects can be copied (e.g. 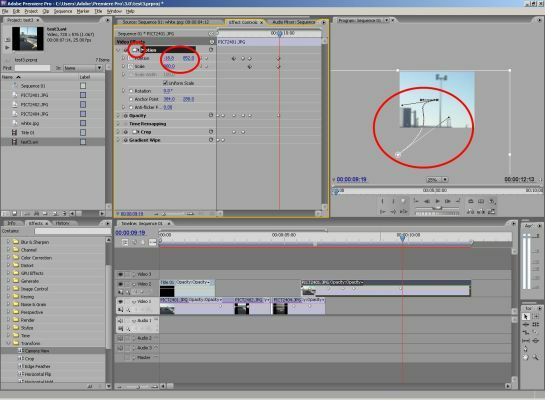 the crop and motion effects to position the landscape pictures) and pasted to other clips. Clips can be run in parallel. Here, "PICT2401" is set on top of "PICT2404". 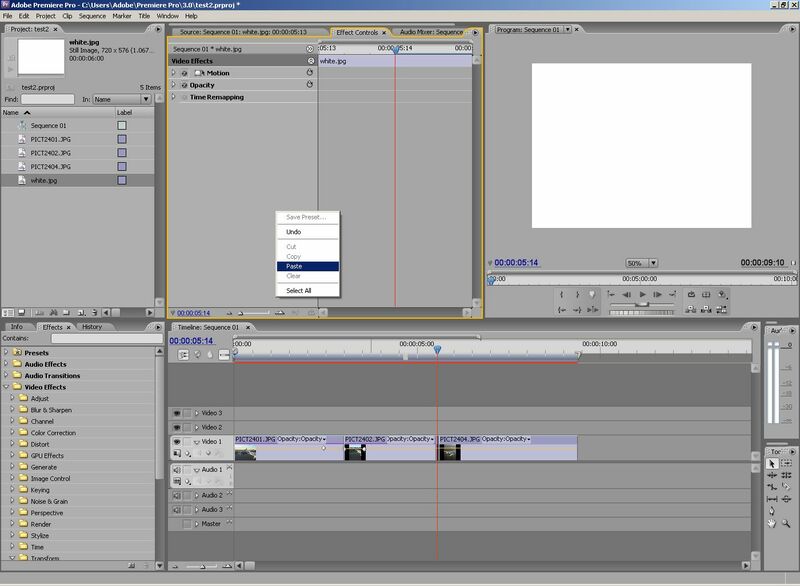 If we now use, e.g., a "Gradient Wipe" effect, we can - using the same technique as above - create a smooth transition from one clip to the other. 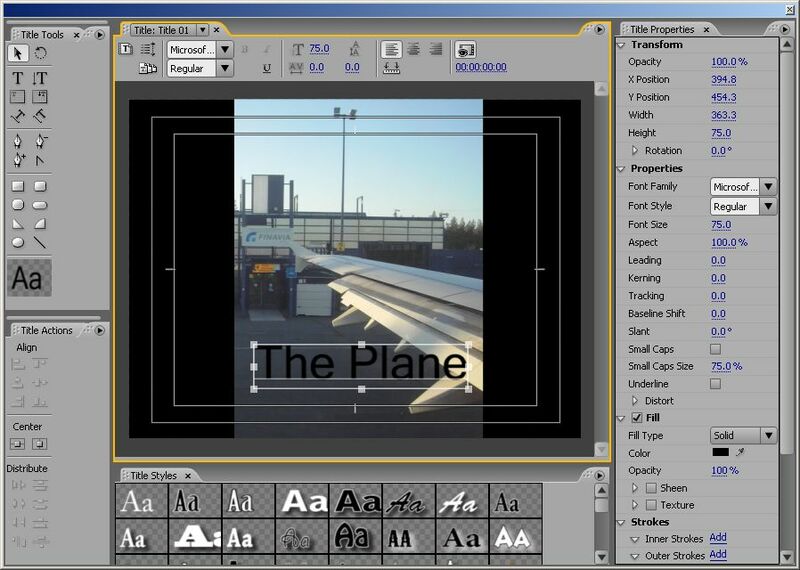 Creating still and moving titles is easy with the title tool. A title is then used as any other clip. Put it on top of other clips and it will be overlaid on those. 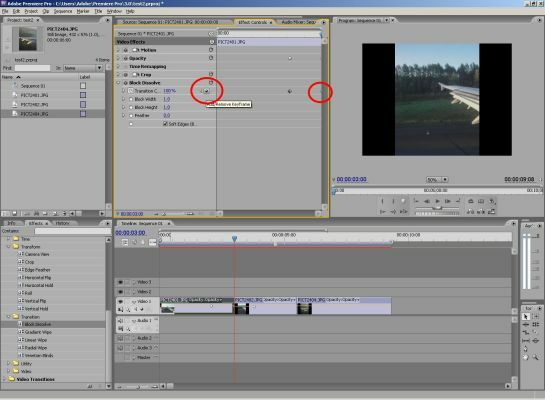 Using "Motion" effect's "Position" and "Scale" parameters, one can easily create zooming an panning effects. This renders a static image much more dynamic without the difficulties that would arise creating the same effect with a video camera. 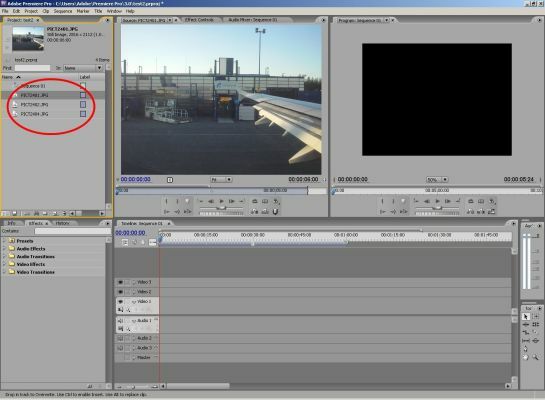 When clicking on the symbol to the left of "Motion", one can also drag the image in the "Program" view. The motion path is displayed. Dragging it you can create Bezier curves on which the clip will be moved. The "Camera" effect is also useful in this context. Still titles can also be used as descriptions / labels. There are a lot of "Presets" effects that can be used to create a set of standard effects. Also important for a concept video is voice, sound and possibly background music. These can be added in similar fashion as clips to the audio spaces in the timeline. Please pay attention that no copyrighted material is used. You can export your movie (File -> Export -> Movie) in various formats. Pay attention that audio is included and don't use too weird codecs since others might have difficulties playing those movies. Also see that the size of the resulting file is moderate since videos can quickly explode in size.